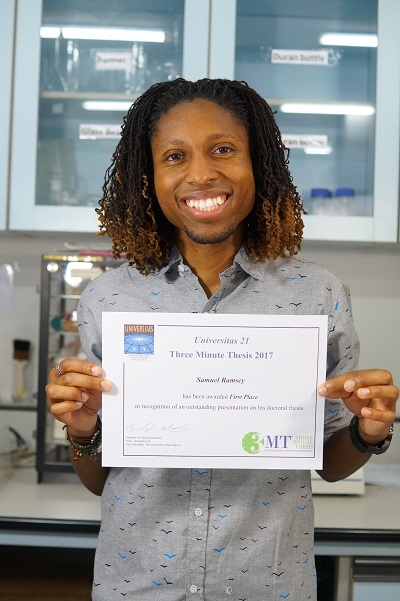 Doctoral candidate Samuel Ramsey has been named both the Judge’s First Place and People’s Choice award winners in the annual Three Minute Thesis (3MT) contest, sponsored by Universitas 21 (U21), a global network of leading research universities. This contest, first developed by the University of Queensland in Australia in 2008, challenges graduate students to communicate the significance of their research to a non-specialist audience in just three minutes. Ramsey, a doctoral candidate in the Department of Entomology, competed against 16 other finalists from U21 member institutions across the world. He was selected for the Judge’s First Place Award by a distinguished international panel of judges from academia, industry and journalism, and received the People’s Choice award as a result of online popular voting, conducted during a two-week period earlier this month. He became the University of Maryland representative to the contest after a campus-wide competition sponsored by the Graduate School, held last spring. Ramsey conducts research on a tiny parasitic mite, Varroa destructor, which is the single biggest contributor to the decline in health of honey populations worldwide. Originating in Asia, the invasive Varroa mite is wreaking havoc on honey bee colonies, both by feeding on adult and immature bees and by serving as a vector for five debilitating viruses. For nearly 50 years, researchers have believed that the mite fed on the hemolymph (the “blood”) of the honey bee. Ramsey has done extensive research on the feeding habits and nutrition of the Varroa mite that provides strong evidence that this model is incorrect, and that current methods of controlling the parasite are not only ineffective, but may contribute to pesticide resistance. Ramsey’s research establishes that the mites are primarily feeding on the honey bee’s fat body tissue—an organ in insects that serves a similar role to the human liver. Since several existing systemic pesticides were formulated assuming the mites fed on hemolymph, this discover explains why these pesticides were never successful in controlling the mites. The mites never would have ingested enough to kill them, but this frequent exposure may contribute to future resistance. Ramsey’s work also explains why honey bees suffer so many negative consequences from a parasite we believed was only consuming a small amount of their blood. His discovery will enable researchers to develop more targeted control techniques that could help restore honey bee populations worldwide. Dr. Steve Fetter, interim dean of the Graduate School and associate provost for academic affairs at the University of Maryland, spoke of the university’s delight in Samuel’s achievement: “We are thrilled that Sammy Ramsey won both the U21 3MT® Judge's Prize and the People's Choice Prize in this year's competition. Sammy's presentation is a wonderful example of how researchers can describe their work to a general audience in a clear, compelling, and engaging manner." Ramsey is currently a visiting researcher at Chiang Mai University in Thailand, where he is studying parasites that attack Asian honey bee populations. He plans to defend his dissertation this spring. University of Maryland students have a highly successful track record in the 3MT contest—winning more awards than any other single institution. In 2015, University of Maryland representative, Carly Muletz Wolz, a doctoral candidate in biological sciences, won the People’s Choice award. In 2014, the first year that UMD entered the competition, Amy Marquardt, who completed her PhD in material science and engineering, won both the Judges’ First Place and People’s Choice awards. Watch Samuel Ramsey's award-winning video online. Read the Universitas 21 3 Minute Thesis Results announcement. Three Minute Thesis Contest results inTimes Higher Education.